I know several folks that have played Apprentice, Journeyman, Foreman. One has hence dual-classed and gone back to school for IT-related training. I like ACK's proficiency system, but I don't like having to take proficiencies multiple times to get better. I'd come across Skills - The Middle Road via -C at Hack And Slash Master back in the summer when I first started to gorge myself upon the OSR blag-o-sphere - it stuck in my brain. So, let's take ACKS down the Middle Road. Unskilled. You don't have the ACKS proficiency. Skilled. Takes 1 month/1000GP of training, or, you have the ACKS proficiency once. Expert. Takes 3 months/3000GP of training, or, you have the ACKS proficiency twice. Master. Takes 6 months/10,000GP of training, or, you have the ACKS proficiency thrice. Take it up to two more times to reduce that throw to 14+/10+ or 7+/3+, gain more abilities. We'll start with the presumption that the first time you pick the proficiency, that gets you to an 'Apprentice' level of knowledge, or, the Middle Road's 'Skilled' level. The rest, however, is experience and training. Now, since the ACKS authors were kind enough to give us a workable economic system, we can correlate the Middle Road training costs with GP earned/Month and find out how to get from one step to the next. Let's start with Art, Craft, Healing, Performance, and Profession, the 5 proficiencies that give us handy tables in the ACKS rulebook, and all more-or-less work the same (though Healing eschews apprentices, which is easily put back in). You've got a Fighter who chose Craft: Weaponsmith back at 1st level - he forged his own sword and was ready for adventure. There's going to be some downtime, now that he and his party is 7th level, and the Wizard needs to do his book-learnin', etc. etc. They're in a middle sized city, and the Fighter talks the local Journeyman (ACKS) or Expert (Middle Road) Smith into a focused apprenticeship - he plonks down 3000 GP, and in 3 months, and gains the abilities of having Craft twice. The apprentices underneath that smith are a mite ticked, however. They each earn 15GP/month (10GP base, plus 50% bonus from being under a Journeyman/Expert). It's going to take them 16 years to have "banked" the 3000 GP necessary to be a Journeyman themselves. If that Journeyman/Expert is under a Master himself, he'll earn 30GP/month - that's 27 years to get to Master. That's 43 years, under tutelage, to go from an apprentice to a master - if a child starts their apprenticeship around 13, they'll be 56 when they master their craft. Let's say our Fighter had less gumption, and stayed home in his hamlet, mastering Weaponsmithing on his own. At 10/gp month, he reaches Journeyman/Expert in 25 years, Master in 41, and will be lucky to see his (13+25+41) 79th birthday in order to master his craft. That is why you apprentice, apprentice. It's also why you adventure. As an aside, if we were to eliminate the proficiency altogether, going from Unskilled to Apprentice/Skilled takes either 1 month & 1000 GP, or, if we assume a beginner makes as much as a full Apprentice, adds either 5 years under tutelage or 8 years self-taught. It's unlikely any human will reach Mastery level on their own. (needing to be 87 to do so). Under training, they'll get there at 64 years of age starting at 13. Much better to assume you gain the proficiency at 1st level, which, if we say you started at 13 and then 18 is the generally accepted adventurer starting age, subsumes the 5 years under tutelage. Now, there was a post on Autarch's boards a while back about how 'regular folk' become master smiths and such, but I can't seem to find it, so I'll make stuff up. If money is experience, the apprentice is earning XP working his craft - either 10 or 15 GP per month. Let's assume 'normal men' advance in saves as Fighters, at the Thief XP level, and since we're mean, Craft isn't on the class proficiency list. If that's the case, a normal man with average Int will get a General proficiency slot to choose craft at 1st, 5th, and 9th level (congruous with name level, which pleases my sense of order). It'll take 10,000 XP to get to 5th, and 170,000 more to get to 9th. Our normal man hits 5th, and therefore Journeyman/Expert, after 83 years if self-trained, or 55 years under an tutor, and another 708 or 472 years until Master. It's good to be a demihuman, I suppose. If our normal man has smart enough to have another proficiency slot to spend at character creation, he's be a prodigy starting out at a Journeyman/Expert level - he'll get to Master in 41 years, self-taught, or 27 years under tutelage. So, there's that. The italicized numbers are the theoretical bit where we eliminate the proficiency entirely, and go purely by training. It would be important to note that most adventuring would start after that period anyway, so it's really a formality. It's purely cosmetic, which is the best kind of change. Now, back to our original thing with The Middle Road, where one saves time with money to advance their skill level. With either of the systems above, the 3 month/6 month timeframe seems a bit too short for an involved profession. I'd rather base the time for the focused apprenticeship off of the actual labor time. That does seem penalizing, since previously our Fighter who hadn't seen the inside of a smithy since he was 0th level could pick up Craft x2 at 5th. 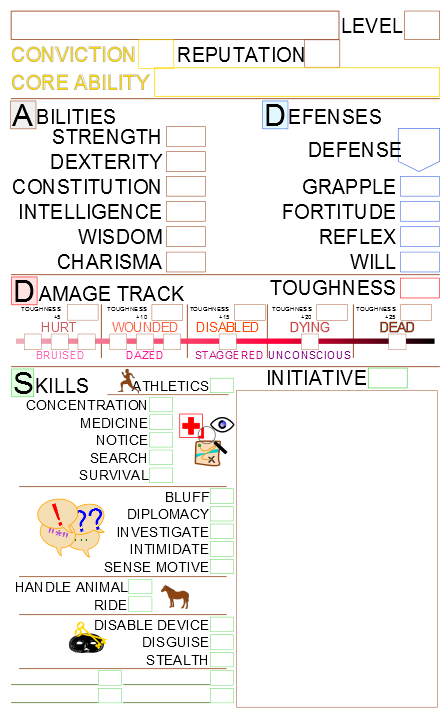 It does make more sense in the ACKS view of occasional extended downtime due to wounds, or, our Fighter at 12th level deciding to finish his mastery of weaponsmithing inbetween domain functions. So - for Identification only, let's do 10% of the time. To include Craftsmanship, 33% of the time, and, as a bone, we'll allow an adventurer to take a 'sabbatical' of no more than 3 months, once every 9 months of training. If misfortune happens, and the character can't get back to his trainer before that time, I'd suggest some sort of INT check once a week to see how much has been forgotten - say, 1 month of training per week. Interestingly enough, a self-taught Journeyman can't save the cash to go out and quick-train himself to Master (we're assuming the money made is all profit, living expenses only exasperate the situation) - by the time he earns the gold, he's already hit Master. In fact, by the time he's saved enough for a Grand Master focused apprenticeship, he's only a couple years away from Grand Mastery himself. So, strangely, these prices for focused apprenticeships seem to work out. And it's a hell of a deal for the tutor - taking some cocky new lord from Zero to Grand Master nets him 27,366 gold in 16 years - normally that's 26 years of work for him, 2 Journeymen, and 3 Apprentices (as per the ACKS table). You've essentially retired 10 years early. Or retired period - presumably one would have worked until death or disability. What it does make possible is the young, self-taught journeyman weaponsmith (took Craft at Fighter level 1), new sword in hand, striking out earn enough treasure to visit BigCity and train with the masters. Eyeballing it, somewhere between level 3 and 4, if our Fighter is careful and spendthrift, he can retire and go off to fulfill his dreams - or a bit after level 5 if he's shooting high. And that is why all the smiths and innkeeps are grizzled level 5 fighters with a +1 Sword on the wall. In future parts I'll detail the remainder of the tabled professions, and start looking at what can be done with the rest. So, the previous post on converting ACKS' d20 X+ to a X:12 system as ASSH does got me thinking about pixelization and resolution of an image. When you reduce an image, the math is done to convey as much of the previous information as possible in a smaller space. Converting those rolls from X+ on a d20 to X:12 on a d12 is somewhat similar - you're looking to convey the same general chance of success in a smaller space. So let's take this all the way down. Starting from 20, I go down the steps of the default dice, down to 2. The last column, after the d2, is extra. 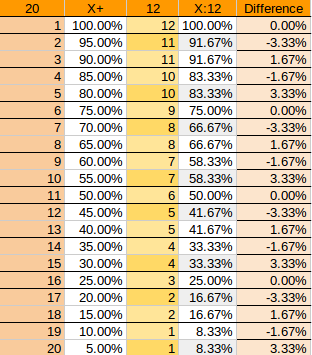 It's the difference in percentage chance from the original d20 roll to d2. I had one of those for each number as I worked my way down. 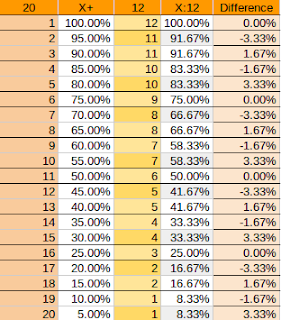 I wanted to get as close as possible to the d20's percentage for each choice, whether that be higher or lower - there's more than a few spots on this table where I could have used one or the other number, and the only difference was one was -1.666% and one was 1.666%, for example. 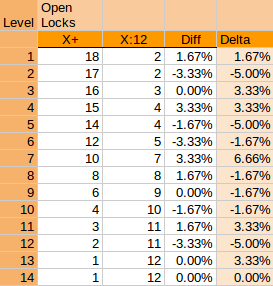 I ought to have paid more attention to the delta, and will probably do that in the next iteration of this table. 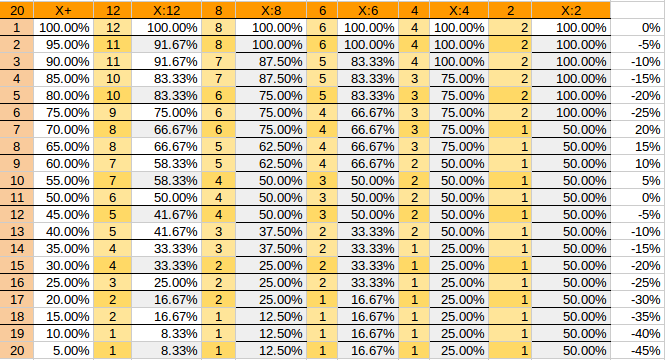 If I'm looking for a 14+ proficiency throw in ACKS, then, I'll want that to be a 4:12 for a d12, 3 in 8 on a d8, 2 in 6 on a d6, 1 in 4 on a d4, and 1 in 2 on a d2. Obviously, some things will convert better than others, but that's the nature of pixelization. An 18+ throw in ACKS at 15% goes up to 50% on a d2 - you've got to have *some* chance, and you've only got 2 numbers to convey it in. I think next I'll start at d100 and work my way down through the DCC dice to d2. I was browsing through talk about Astonishing Swordsman and Sorcerors of Hyberborea (here ever after named ASSH) and I was tickled that the thief skills use d12s. I've never really gotten much chance to use d12s. It's a shame, really. They're like low-resolution d20s, nice and round and chunky to roll. d10s are dumb. Too pointy. Anyway. So, what if I wanted to redo all the ACKS skills and proficiencies in d12? So, there's that to work from. Chance to roll X+ on a d20, or X:12 on a d12. Note I'm looking for best fit, not mathematically best. That statement will make more sense in my next post. To read this, say you need an 18+ in ACKS. That goes closest with 2:12 - you've got a 1.67% better chance at 2:12 than 18+. Our biggest flux is +/- 3.33% - that's less than a +/- 1 on a d20, in theory. I expect this to all fall apart on the next table. Let's see what the thief skills look like. We'll start with Open Locks. OK. So, 'Diff' is the percentage change from X+ to X:12. Some levels fare better than others. 'Delta', however, is the change in change from one level to the next - a level 1 thief in X+ gains 5% more ability when she hits level 2, in X:12, none - she loses 5%, essentially, from her guildmate using the X+ system. Lucky level 7 is the best it gets. Worth doing? Probably not. ASSH actually uses the venerable d12, whereas I'd be hard pressed to place the die in anything ACKS does. It's much better systemically to follow along with ACKS using a d20 than to introduce Yet Another Wrinkle in what to roll for what. Dark Earth Games got me thinking here about a very short run I did of an Mutants And Masterminds 3E game, and, before I fell into the OSR, a short fling I had with planning to run True20. There's an alternative system from 2007 (oh, how time has moved, oh, how old you are now True20!) 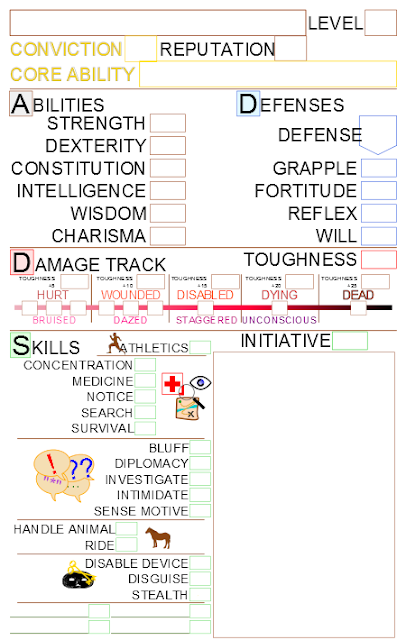 - Baduin's Alternative Damage System and then some modification to that here that inspired me to putz around with what ended up being a Damage Track on a character sheet I was planning to use. My main draw to the system was simply missing the change to roll damage! It's ingrained, I guess. Your Toughness becomes a static number, which then has 5 degrees added to it for how badly you're hit, depending on the damage your attacker rolls. Works out simply as such: An attacker just hit our Adept with a sword, Damage 2, plus STR 1, rolls a 20 and adds 3. Let's say he gets a 13. Our squishy Adept with (static) Toughness 4 compares that on the table. He's already filled in the large upper boxes on the Damage Track with values 9, 14, 19, 24, 29. The Adept is hit for Damage 4. Less than 9, he is unscathed. Damage 12 - second box under Hurt is filled in. Damage 15 - first box under Wounded. Archers take aim, and he's hit for 7 and 9. He fills in the last box under Hurt from the Damage 9 arrow. The first one winged him, a minor scrape. A sword-strike for 11 - his Hurt boxes are full, so he fills in the second Wounded box, the lowest box he can take. He's in trouble. Another arrow volley - 15 and 16. The last Wounded box is filled in, and, since he's out of those, he has to fill in the Disabled box. He's in trouble, and limps off to cover. Note squishy folks are squishy - an Ogre, perhaps, swinging a club, could be rolling d20+7 for damage - if that Ogre pops out a roll of 18 or better, our Adept is dead. This system doesn't really address the 'spiral of death' that happens with the Toughness save as written - it helps a little in that you're not penalizing a poor Toughness save with further penalties as you get damaged, but there can be a sudden drop-off if you're in a long, low damage fight, and you're just simply running out of boxes. In fact, I wrote a little Perl to give me some math on this back when I was working on it. The Attacker's to-hit is +4, and so is his damage. The defender's Defense is 4, as well as his Toughness. A battle of average men. This was 100,000 simulated battles, I think? It takes about 8 hits, if that defender just stands there and takes it, to get killed. The attacker drops the defender to Dying on 1 hit 5% of the time (he rolled a 20!) That program didn't take into account any further penalties from the damage conditions. 9 and 30 Kingdoms recently posited on the wonder that is the Purple Worm. Many sages posit that sometimes, ever so rarely, when the stars are right, the sun unflared, the tectonic plates shifted *just so*, an ancient purple worm finds itself a enormous underground geode, curls up, and metamorphoses into a Tarrasque - breaking out from the newly mineral-depleted geode to wreak havoc and lay eggs for it's limited, 6 month lifespan.